This inspirational artwork features a quote from Helen Keller. Bringing artful intrigue to an inspiring message, this vibrant piece by Alena Hennessy celebrates the power of a positive outlook. 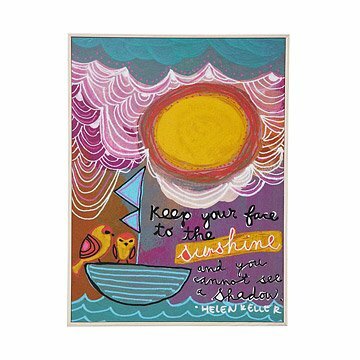 Whether you're gifting for a new graduate or celebrating your own aspirations, this expressive artwork offers encouragement with an empowering quote from Helen Keller--"Keep your face to the sunshine and you cannot see a shadow"--nestled among fair weather clouds above two birds sailing on gentle seas. Display this compelling piece unframed on high quality Hahnemuhle Torchon acid-free watercolor paper, or an archival print mounted on wood and framed in an ash molding. Made in Portland, Oregon. Alena Hennessy calls the positive mantras in her pieces "intentions" which she hopes leave people transformed, content, and open to wild possibilities. She views the process of art-making as a kind of therapy or healing, "one that brings us to quieter and more meditative states of being." She makes her home in Asheville, North Carolina, with her champagne fox Mimi Simone. Visit our blog to learn more about how Alena combines powerful words and visual art to spread positivity. This bright and intriguing picture will inspire anyone to see the sunny side of life. The quote, attributed to Helen Keller, will inspire and motivate as one ponders the depth of Keller's words. The quote compliments the intrigue of the artists style. Just lovely! What a positive message for my child to look upon everyday. The art is darling and its very well made. Highly reccomend.